Please keep in mind that these “10% Trade” alerts are for information purposes only. We’re not registered financial advisors and these aren’t specific trade recommendations for you as an individual. Each of our readers have different financial situations, risk tolerance, goals, time frames, etc. The ideas we publish are simply ideas that we feel fit our specific needs and that we’re personally making in our own portfolios. You should also be aware that some of the trade details (specifically stock prices and options premiums) are certain to change from the time we make our trade to the time you’re alerted about it. So please don’t attempt to make this “10% Trade” yourself without first doing your own due diligence and research. For the past few months I’ve been showing readers how to use “10% Trades” to help double… triple… or even quadruple their annualized yield on relatively safe stocks like Wal-Mart (WMT), McDonald’s (MCD), Microsoft (MSFT)… and many more like them. If you’re just joining us, you may be wondering what exactly a “10% Trade” is. In short, it’s a conservative income-oriented trade that typically lasts just six to 10 weeks and that involves selling either a covered call or a cash-secured put on a high-quality dividend growth stock. 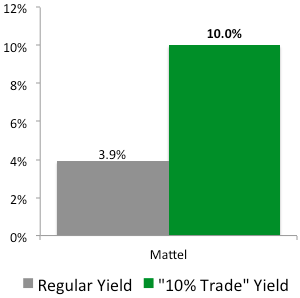 By its very nature, a “10% Trade” is designed to generate at least a 10% annualized yield. Of course, “10% Trades” aren’t risk-free… and it’s impossible to keep up a 100% success rate forever. But if you’re the least bit interested in boosting your yield on high-quality dividend growth stocks, then you owe it to yourself to take the time to understand how these trades work. It’s with this in mind that I’ve been sharing the details behind many of my real-life, real-money “10% Trades”… and why I’ll continue to do so. That said, a new “10% Trade” opportunity came across my screen yesterday with leading toymaker and Dividend Challenger Mattel (MAT)… and I liked the setup enough to pull the trigger. At the time I made my trade, MAT was selling for $38.96 per share and the July 19, $37.00 puts were going for $0.65 per share. My “10% Trade” involved selling three of these puts… and there are only two possible ways this trade will work out. On one hand, I’d get to generate a 10.0% annualized yield from MAT — which is more than double the stock’s current 3.9% dividend yield — without even buying shares. On the other hand, I’d get to buy a decent dividend growth stock at a 6.5% discount to what it was trading for yesterday. That’s an important discount, as MAT looks fairly valued at current prices. 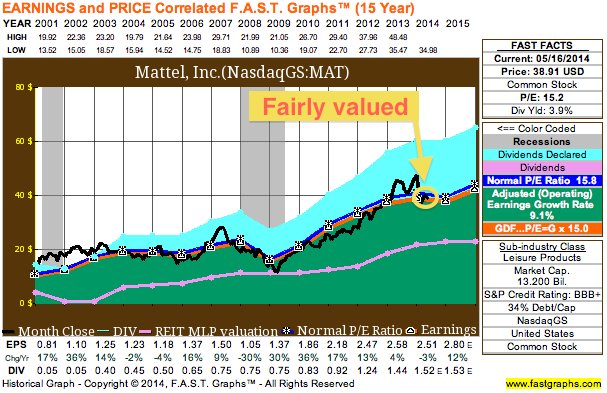 To get a gauge on a stock’s valuation, I like to use Chuck Carnevale’s FAST Graphs. I realize there’s a lot going on in the FAST Graph below, but all you really need to know is that when the black line is on the orange line — as it is now — the stock looks “fairly valued.” So if I can pick it up at a 6.5% discount from here, great. 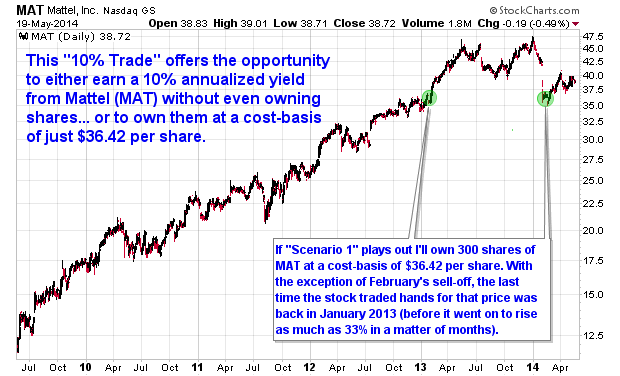 If MAT falls below $37.00 by July 19, I’ll be obligated to buy 300 shares at $37.00 per share. That’s significantly cheaper than what the stock was trading for when I sold the puts yesterday. In exchange for my agreement, I was paid an instant $195.00 (300 shares X $0.65 per share) before commissions. This money was deposited into my account immediately. Taking this income into consideration – and subtracting out the commissions – my cost-basis will drop to $36.42 per share. That represents a 6.5% discount to the $38.96 share price that MAT was selling for at the time I made this trade yesterday. So in “Scenario 1” I’m getting paid instant cash while I wait to buy MAT at a discount. If MAT stays above $37.00 by July 19, the contract expires worthless and I get to keep the $195.00 in income (before commissions). After commissions, this works out to a 1.7% return on what my purchase obligation would have been ($0.65 / $37.00) in 61 days. If I can repeat this trade over the period of a year I could generate a 10.0% yield from MAT without even buying shares. I’ll continue to keep you posted as I make these trades, but please keep in mind that they aren’t intended to be specific recommendations. Everyone has different financial situations, risk tolerance, goals, time frames, etc.